Coventry City boss Steven Pressley has quickly branded as "lies" an internet blog claiming that he has lost the dressing room at the Ricoh Arena. "Most managers will not answer questions on blogs or internet rumours," Pressley told BBC Coventry & Warwickshire. "But the one thing about me is that I never duck any questions. "I'm a manager who accepts criticism on tactics, on team selection, on results. "That's the nature of the industry. The one thing I don't deal in is lies." Speaking at his pre-match press conference ahead of Saturday's trip to fellow League One strugglers Gillingham, he added: "I've been briefed about it and that is what I'd say to the blog that is being referred to." It is coming up for two years since the 41-year-old former Rangers, Dundee United, Hearts, Celtic and Scotland international centre-half came south from Falkirk. 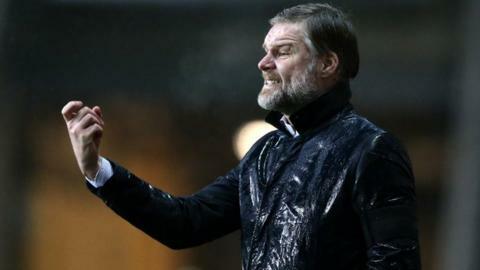 Since being appointed on 8 March 2013, Pressley is just six short of 100 matches in charge of Coventry City, of which they have won 32 and lost 36. Yet Elgin-born Pressley has had to contend with the massively distracting backdrop of the club's off-field woes. As well as twice being docked 10-point penalties for the club's owners - Sisu, now rebranded as Otium - going into administration, while fighting against their landlords at the Ricoh Arena, City even underwent a whole season in exile at Northampton. Pressley has generally been viewed by fans as a popular, engagingly frank character, who has motivated his team well in adversity. But, since returning to the Ricoh in September, City have faltered. They have been made to play second fiddle at their own stadium following four months of initial speculation, followed by the confirmation, then the harsh economic reality, of their new landlords Wasps' well-marketed move to the Ricoh Arena. Since the news broke of Wasps' arrival, Coventry have won just four times in 18 League One games, as well as suffering the embarrassment of losing at home to non-league Worcester City in the FA Cup. Pressley has also not had much luck with injuries, his latest blow being the loss of Danny Pugh. The 32-year-old utility man, out since mid-October with an ankle injury, now looks set to miss the rest of the season.